Oakley SI Quarter Jacket (Matte Blk/Grey) » Protective Solutions, Inc.
O Matter® frame material is one of the secrets behind the durability and comfort of this frame. It’s a stress-resistant, lightweight synthetic that maintains a critical degree of flexibility to offer a feel-good fit with impact resistance. By making contact only at the bridge of the nose and sides of the head, our Three-Point Fit further improves comfort while holding the lenses in precise alignment so they can give you performance that meets all ANSI Z87.1 optical standards. 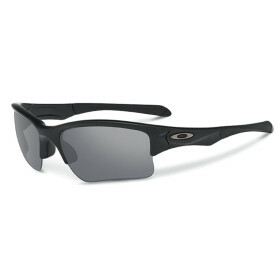 The 8.75 base lens curvature extends your peripheral view while improving side protection against sun, wind and impact. Head-on protection meets ANSI Z87.1 standards for high-mass and high-velocity impact, and our Plutonite® lens material filters out 100% of all UV. Quarter Jacket offers the ultimate youth sport frame with uncompromising performance, comfort, protection and style. And with its interchangeable lens design, you can keep up with changing light. For glare reduction and balanced light transmission that tailors your vision to the environment, choose lenses with Oakley Iridium® coating (sold separately).